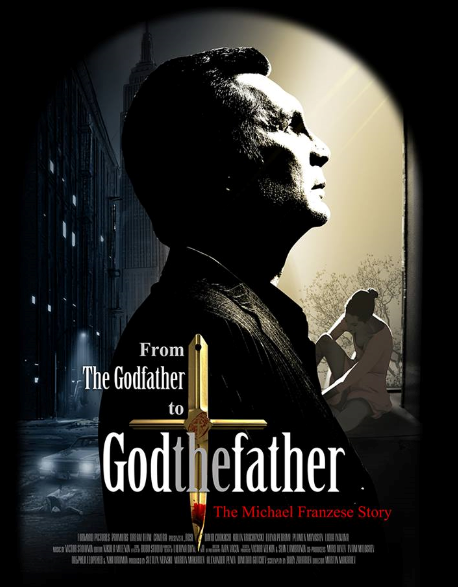 (Los Angeles, Calif.) –October 17, 2014 – The upcoming release God the Father, slated for release on October 31, the day Michael Franzese, once dubbed the Prince of the Mafia, became a “made man,” vividly depicts both Franzese’s life as a Mob kingpin and as a man transformed by faith. The film does not shy away from illustrating the real world and life that Franzese swore allegiance to. But it is a scene of Christ’s Crucifixion shown as part of his prison epiphany and the Mob stock footage scenes combined, that tipped the scales at the MPAA who gave the film an R rating. Franzese made over a billion dollars for his crime “family,” earning more than anyone since Al Capone. It was enough to place him at #18 (3 behind John Gotti) on Fortune Magazine’s “Fifty Most Wealthy and Powerful Mafia Bosses.” He was a Hollywood producer, a restaurateur, a night club owner: He was living the life of a man’s man as he saw it. A revelation that his own father went along with planning a hit on him, the love for his own family, and a realization that his life was heading like every other Mob guy before him straight to St. Johns Cemetery in Queens, New York, that made Franzese decide to leave “The Life.” In an act thought impossible, he publicly walked away from the Colombo family and organized crime. God The Father takes audiences on the untold personal journey into the life and spiritual transformation of Michael Franzese, a young and charismatic Capo in the Colombo crime family during the 1980’s-90’s, who’s notorious father Sonny Franzese was also a renowned Underboss. It’s a true story about mafia, money, love, loyalty and God. GOD THE FATHER opens on Friday, October 31 across the country in select theatres. It is rated “R” for violent images by the MPAA and has a running time of 101 minutes. Following in his father’s footsteps, in the mid-1980s, Fortune Magazine listed Franzese as number 18 on its list of the “Fifty Most Wealthy and Powerful Mafia Bosses.” According to a Federal report, Franzese made more money for a crime family than anyone since Chicago Outfit boss Al Capone. A revelation that his own father went along with the hit on him, the love for his family and a realizing his life was heading one way like every other Mob guy before him, straight to St. Johns Cemetery in Queens, New York, Franzese took the decision to leave the ‘Life.’ An act thought impossible, he publicly walked away from the Colombo family and organized crime.